I can’t count how many times I have bought or been given recipe books, I have tried 1 or 2 recipes which are so-so or I have never made a thing from them as the ingredients are unusual and not things that I have in my kitchen. 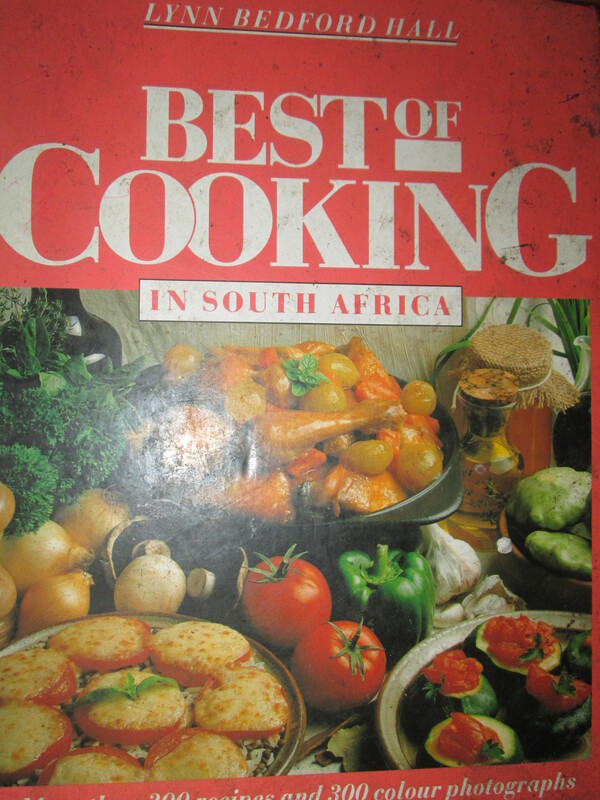 About 20 years ago my Mum gave me what I call ‘The Red Book’, ‘The Best of Cooking in South Africa’ the cover these days is white. The fact that since the first edition in 1988 this book is still in print bears testimony to the fact that it is something very special. Since I could use a scale unassisted I have loved baking but was always a little nervous of cooking meals. It was thanks to Lynn Bedford hall that my cooking ever graduated past spag bol, crumbed fish and mac cheese. Her recipes are simple to follow, generally quick to prepare and of restaurant quality, actually better than most restaurants that I have visited. Last week I made 3 recipes from her book and this is an average representation of any week of the year. Last week we had ‘Spicy Chicken Curry’ which was frozen, when I made the 1st batch I doubled the quantity and froze half, ‘Baked Kingklip with Almonds’ (I used hake instead), this is delicious and ridiculously quick and easy and Apple Tart with cinnamon pastry (1st time I’ve done this one). Another Amazing thing is that every section is good from the soups to cakes. ‘Chocolate Creams’ which I spread with melted choc are my husbands favourite cookies, the ‘Favourite Fruit Cake’ is just that, I do it for Christmas every year, I generally make at least 4 as I give them away as gifts to teachers and family too. I plan to make one this week as it is too good to only have once a year, the hard part is leaving it for a month to mature. 20 years later I am still trying the odd recipe which I had not made yet and am always delighted. I have 2 other Lynn Bedford Hall recipe books ‘Return to Corribush’, last night I made Chilli Beans with corn and Avo from that, and ‘Fabulous Food’. My only wish is that she had a vegetarian cook book, I have read that she did one once but it is out of print, what an awful pity as I would so love it for ‘Meat Free Mondays’. If you could only own 1 recipe book ‘Best of Cooking in South Africa’ is THE book. If you want more, get a couple of her others, you simply can’t go wrong. Bought her Food with Flair in 1975 and it has travelled with me around the world, battered and stained, but still in use. Not only are the recipes healthy and excellent, but the writing is witty and a pleasure to read. I have just made herbed buttermilk bread once again, but am wondering whether my scale is faulty. I weighed out 500 grams of self raising flour but found it was too much for the liquid, Ie the buttermilk and egg, so left out what I thought was the excess. The bread turned out very well, but I thought I should check whether 500 grams of flour is correct? If I could have only one cookbook, it would be my old red copy of The Best of Cooking in SA!